One of the best annual Comic-Con traditions is back: the Warner Bros.-branded convention bags! 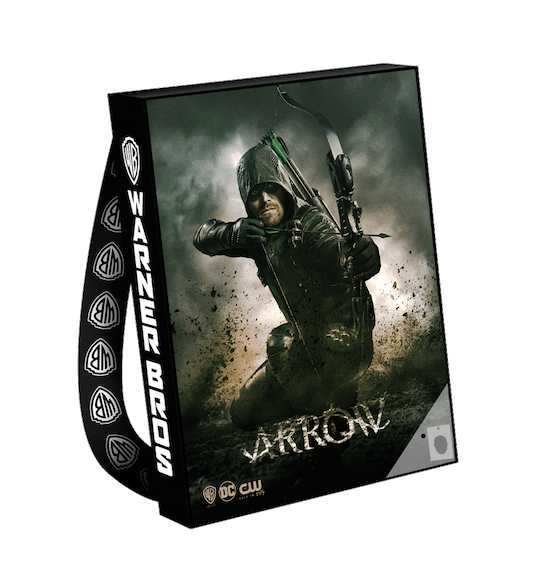 This year, WB has 18 different bag options (ARROW, BLACK LIGHTNING, DC’S LEGENDS OF TOMORROW, THE FLASH, KRYPTON, SUPERGIRL, SUPERNATURAL, CHILLING ADVENTURES OF SABRINA, CASTLE ROCK, DC SUPER HERO GIRLS, YOUNG JUSTICE: OUTSIDERS, CONSTANTINE: CITY OF DEMONS, and films AQUAMAN, FANTASTIC BEATS: THE CRIMES OF GRINDELWALD, THE MEG, and TEEN TITANS GO! TO THE MOVIES, plus two bags for DC Entertainment), with pins representing Arrow, Aquaman, Batman, Black Lightning, Catwoman, The Flash, Harley Quinn, Joker, Martian Manhunter, Nightwing, Superman, and Wonder Woman. Check out many of the available bags and pins! Warner Bros. has revealed its Comic-Con plans. In addition to RIVERDALE getting promoted to Hall H (the biggest room at the convention), new NBC series MANIFEST is getting a premiere screening and panel, as is the new Hulu anthology CASTLE ROCK (which premieres the week after the convention). The CW has set its 2018-2019 lineup. With the network now programming originals on Sunday, the fall lineup will boast five DC series, plus the reboot of CHARMED and THE VAMPIRE DIARIES/ORIGINALS spinoff, LEGACIES. The CW has renewed much of its current lineup. 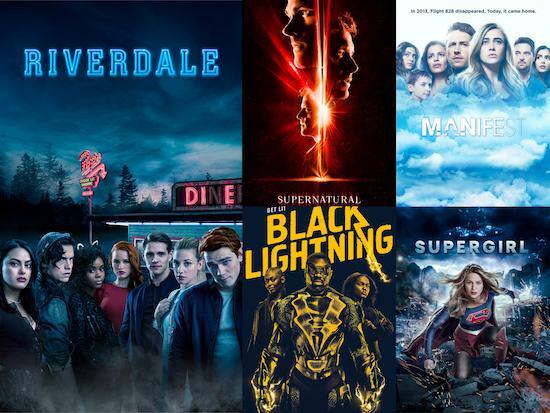 ARROW, BLACK LIGHTNING, CRAZY EX-GIRLFRIEND, DC’S LEGENDS OF TOMORROW, DYNASTY, THE FLASH, JANE THE VIRGIN, RIVERDALE, SUPERGIRL, and SUPERNATURAL will all return for the 2018-2019 season. Which renewal are you most excited for? 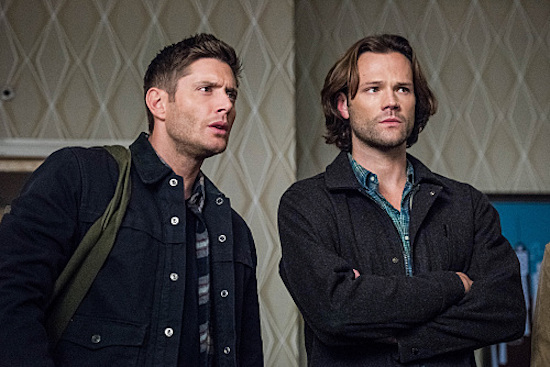 The CW has set finale dates for a number of its shows. DC’S LEGENDS OF TOMORROW will wrap up its season on Monday, April 9 at 8/7c. (SUPERGIRL will continue its season there when LEGENDS concludes.) Meanwhile, IZOMBIE’s fourth season will end on Monday, May 28 at 9/8c. BLACK LIGHTNING’s inaugural season ends on Tuesday, April 17 at 9/8c; THE FLASH’s year concludes on Tuesday, May 22 at 8/7c. 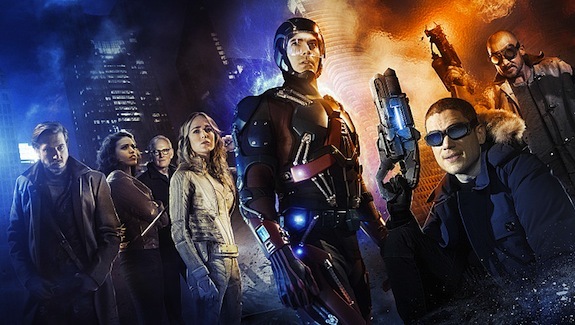 LEGENDS OF TOMORROW kicks off tonight on The CW, and many of the faces taking center stage are familiar to fans of ARROW and THE FLASH: Sara/White Canary (Caity Lotz); Ray/Atom (Brandon Routh); Stein (Victor Garber) and Jax (Franz Drameh), AKA Firestorm; Snart/Captain Cold (Wentworth Miller); Mick/Heat Wave (Dominic Purcell); Kendra/Hawkgirl (Ciara Renée); Carter/Hawkman (Falk Hentschel); and baddie Vandal Savage (Casper Crump). But there is one new face in the series, and he’s who ties the mismatched group of heroes and villains together — Rip Hunter (Arthur Darvill). Rip gathers the team together to take down Vandal, and the chase (throughout the world and time) is on.